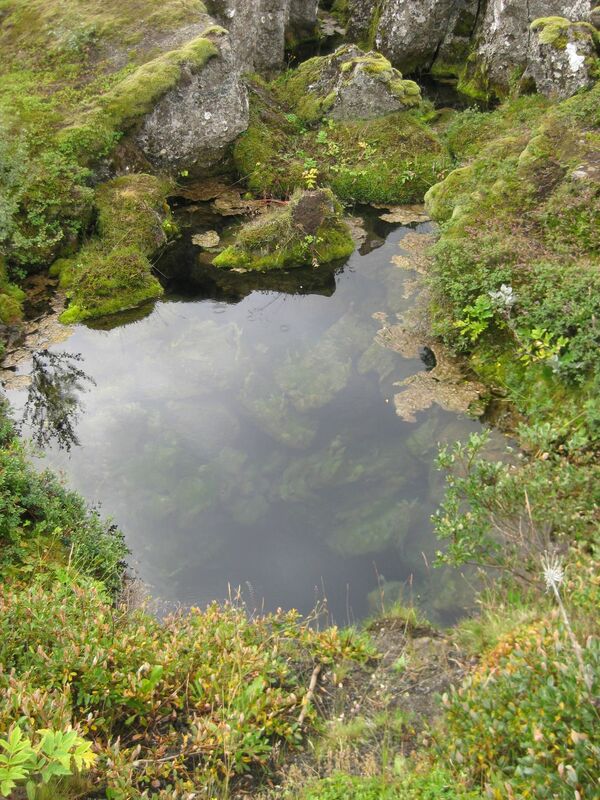 I visited the Blue Lagoon, one of the most popular tourist spots in Iceland. Fun and nice, but a little weird, as are all hot spring resorts, I think. 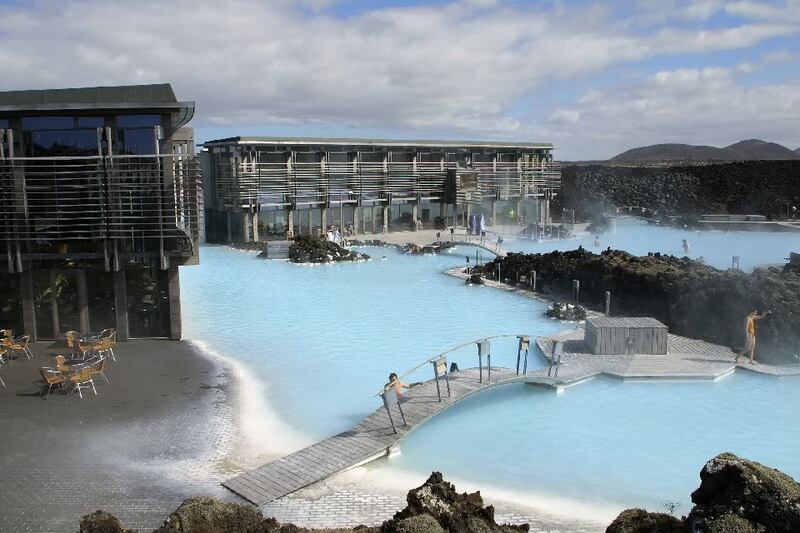 Eerie blue water that is nice and warm, with pots of white silica clay to slather onto your body. 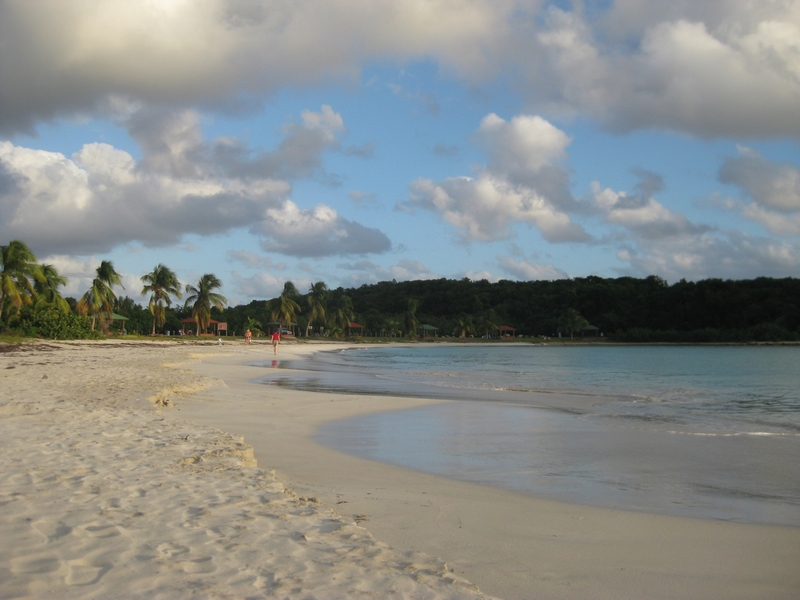 People wading about with clay-white faces, taking pictures of one another. The pictures below show how it looked in 1998 and how it is today. Gone is that bizarre industrial background that makes it seem like a science fiction set. I kind of wish they had left it that way. 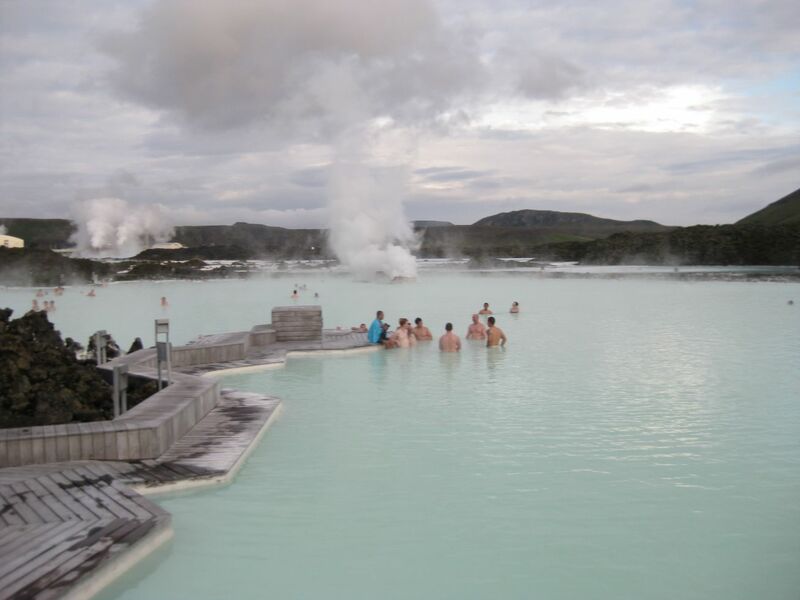 For those who want to avoid the pricey admission fee or the tourist scene at the Blue Lagoon, there is still the possibility of a refreshing soak in runoff from the many geothermal hiking areas around. I don’t know why, but this just brings Chaucer to my mind. Besides hiking and bathing, there are other amusements in hot-spring land. 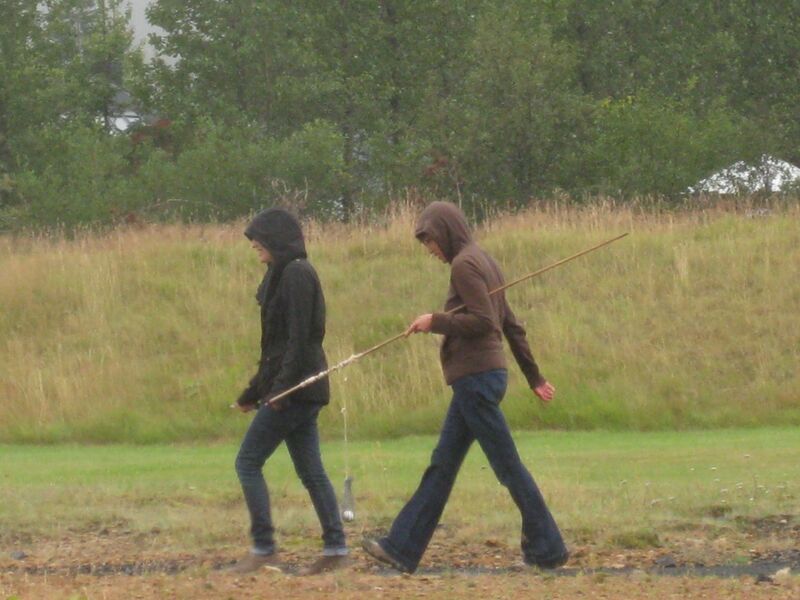 Here are two people off to boil an egg in the runoff from a steaming borehole. Much of the landscape around Reykjavik is rather forbidding, but I find it very beautiful. 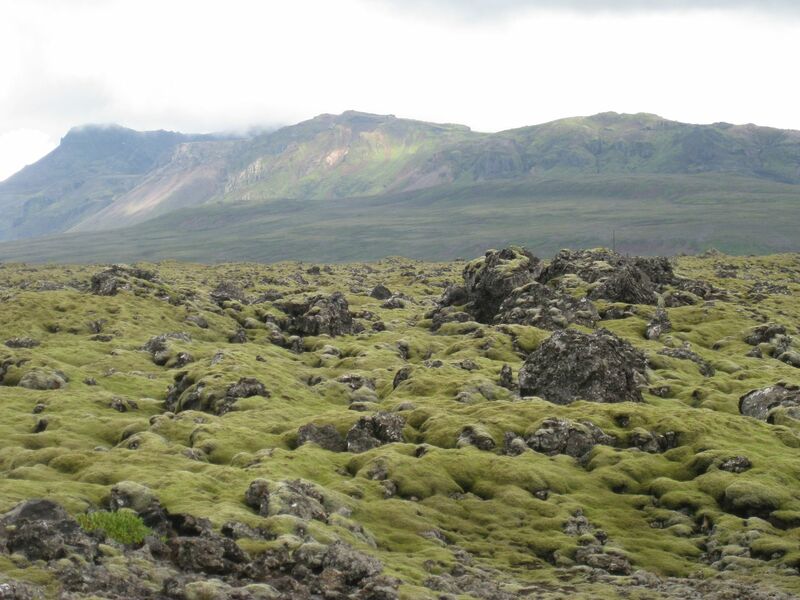 It has large plains covered in black lava flows, with thick, uneven carpets of moss. 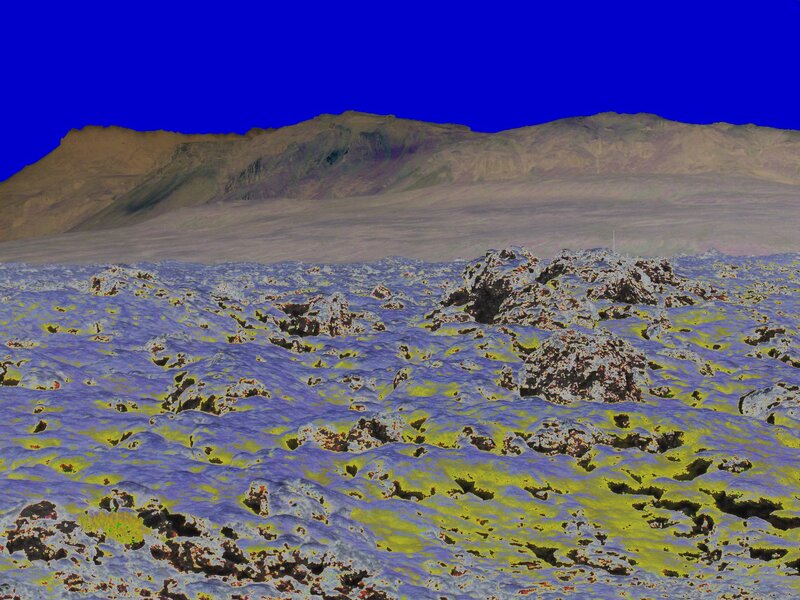 I suspect that Iceland may have been featured in the final landing sequence of Kubrick’s 2001. This one looks like something out of Escher. Is there a similar backlash now in the environmental movement, I wonder? I’m thinking of three young writers, all deeply interested in the man-nature ‘interface,’ who seem to be at pains to distance themselves from what they consider a soddenly romantic or New-Age-y environmentalism; the “we must heal/save/worship the Earth” variety. NC: In your new book … you argue that “we are already running the whole Earth, whether we admit or not.” You say this calls for a new definition of nature beyond “pristine wilderness,” which no longer exists and hasn’t for some time. How must nature be defined now? 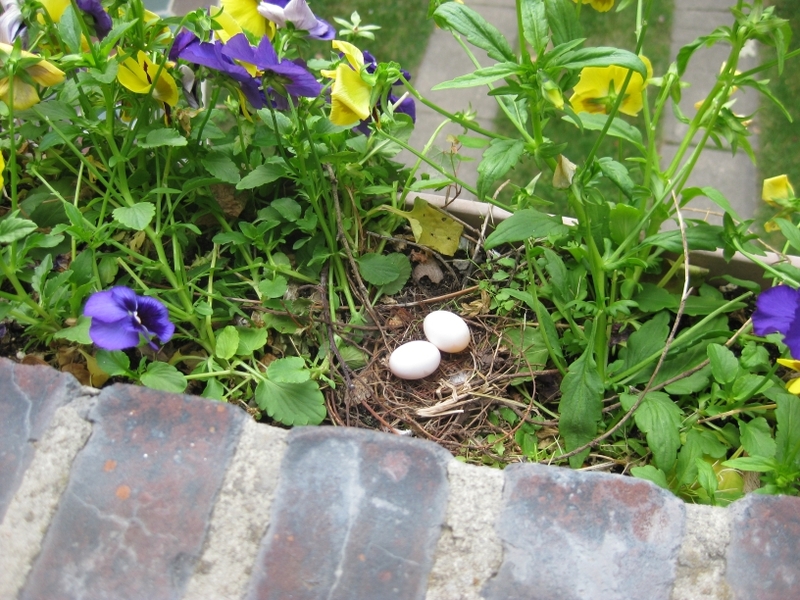 EM: I struggled with that definition in the book, since much of my argument is about enlarging nature to include more kinds of things and places beyond pristine wilderness, from backyard birds to city parks to farms. . . . I am not sure we need a rigorous and watertight definition. We know nature when we see it, because we respond to it. At any rate, there’s a lot more of it out there outside of designated nature reserves than inside. 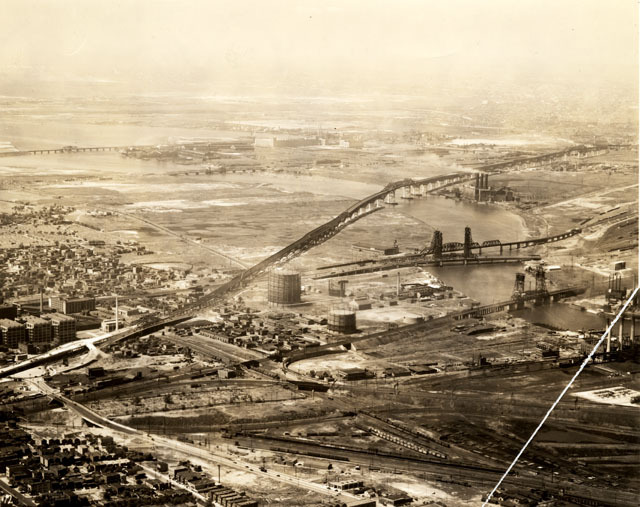 Sullivan’s account of the Meadowlands is anecdotal and genial, but his book, covertly ambitious, takes up serious matters. By looking observantly, without trite moralizing, at the natural world as well as at the disposable world we build, and at the great overlap between the two, this book suggests a challenging new model for how we ought to pay attention. There are an awful lot of deep and unresolved contradictions in the philosophy of environmentalism as it is processed through political advocacy and the media machine these days – no surprise that! Perhaps these new writers, who seem alive to the humor, irony, and foolishness of these contradictions, are part of a larger trend that may be able to create a more sustainable environmental philosophy. … fuimos al parque para el almuerzo. 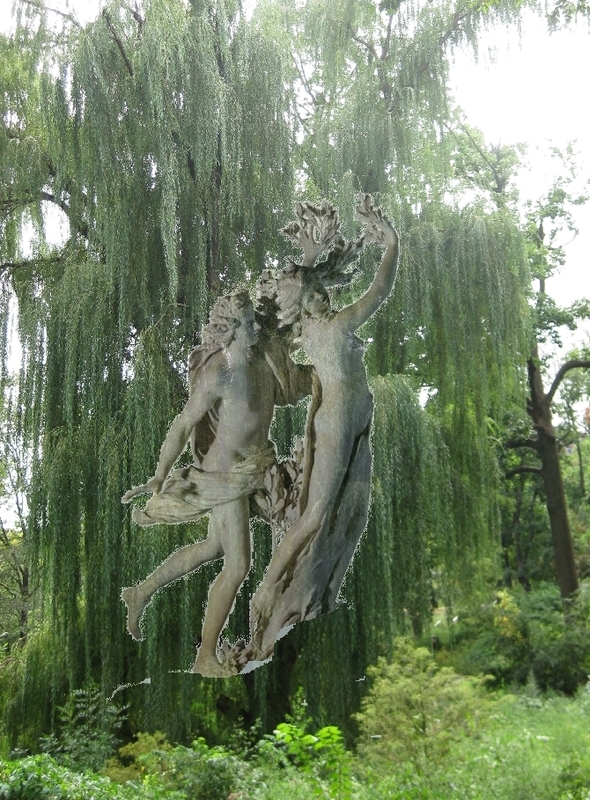 There is a large weeping willow nearby. Looking at it, I think of poor Daphne pursued by Apollo. Those corny Greeks. Life goes on around and without us. 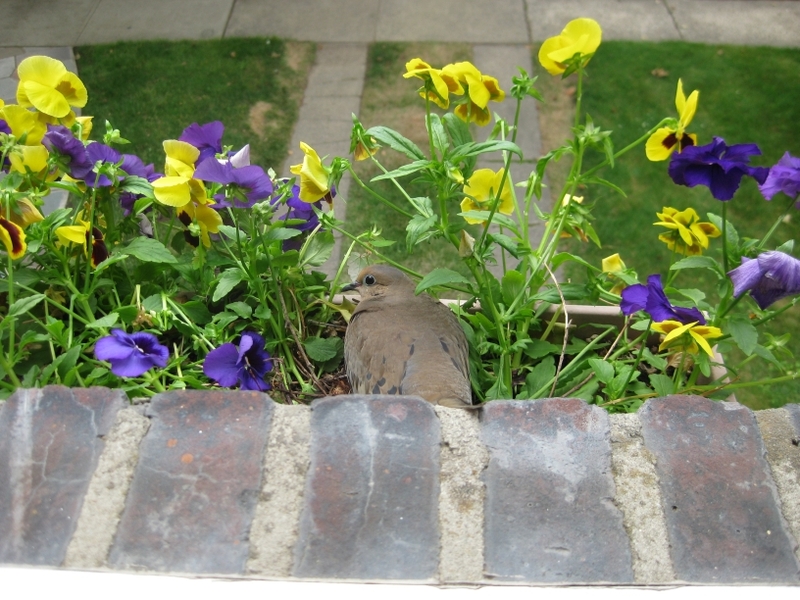 This dove has trampled some of my flowers in my bedroom window box for a good purpose. Ah, back to one of my favorite hobbyhorses – Man & Nature! Over at the civilized roundtable hosted by Man_of_Roma, there was a little exchange about irony and nature, apropos of religion. Personally, I see little irony in the relationship of man and nature (if we can just sort out what that relationship is…) other than the fact that we humans are so smart, yet so blind at the same time. We insist on thinking that the universe somehow cares about us, or is, at least, cognizant of us. That something is out there that …um…well, thinks about us. I don’t think so at all. Voltaire, such a clever fellow, was shocked, yes shocked, that God, if he exists, could destroy such a fair city as Lisbon with all its innocent inhabitants. (Is that ironic. I mean, didn’t he read any history?) Rousseau was more phlegmatic in his response, and he’s considered the blustering romantic. (Another irony? Note, they are all cultural ironies.) 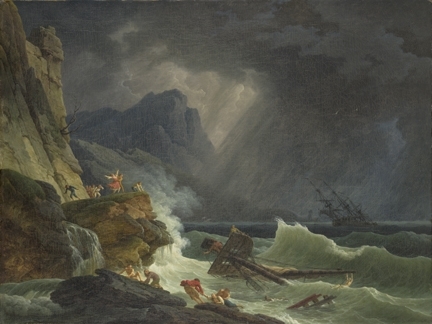 I’ve posted about their exchange of ideas on the Lisbon tsunami/earthquake here. Here in my town, we had a little bit of Nature’s irony last night. 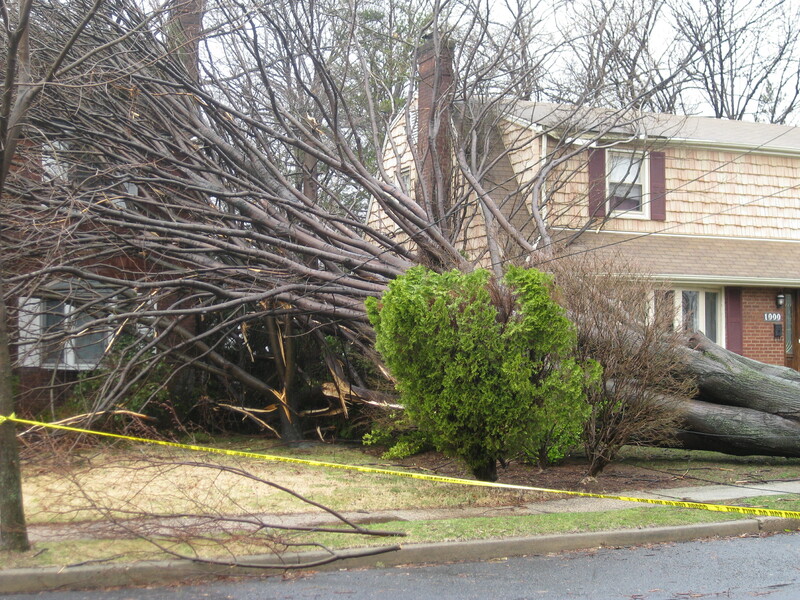 A ripping storm moved through with terrific winds, knocking down 150 trees in in Teaneck alone. 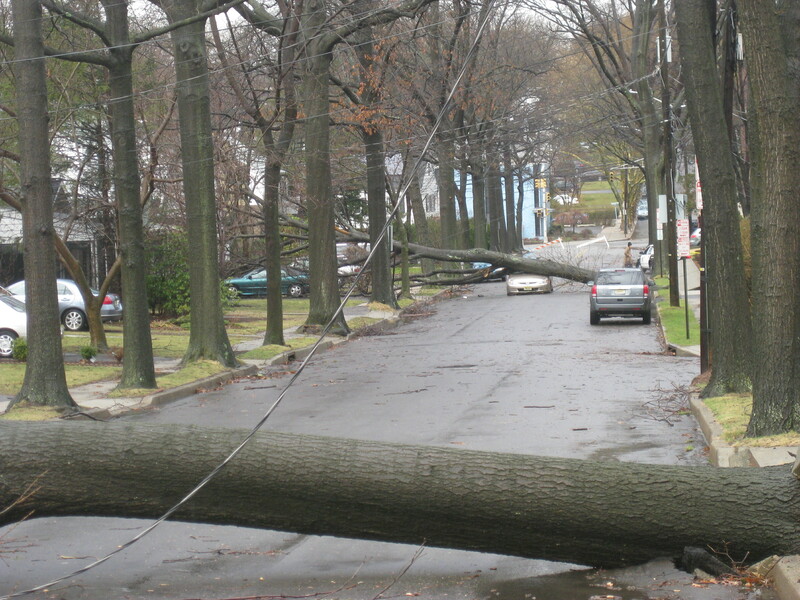 (Amazing – our power didn’t go out for once!) I’ve posted pictures from this morning below. Ah yes, the trees! Trees are so good! Protect trees, be green. No, trees kill! 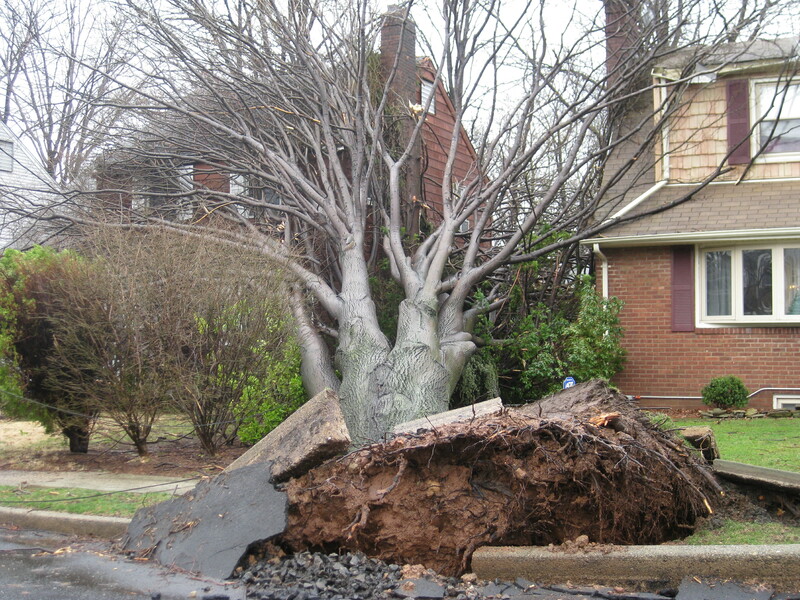 Trees are the instrument of evil Nature! Or is it the weather, the storms? Whom, what do we blame? 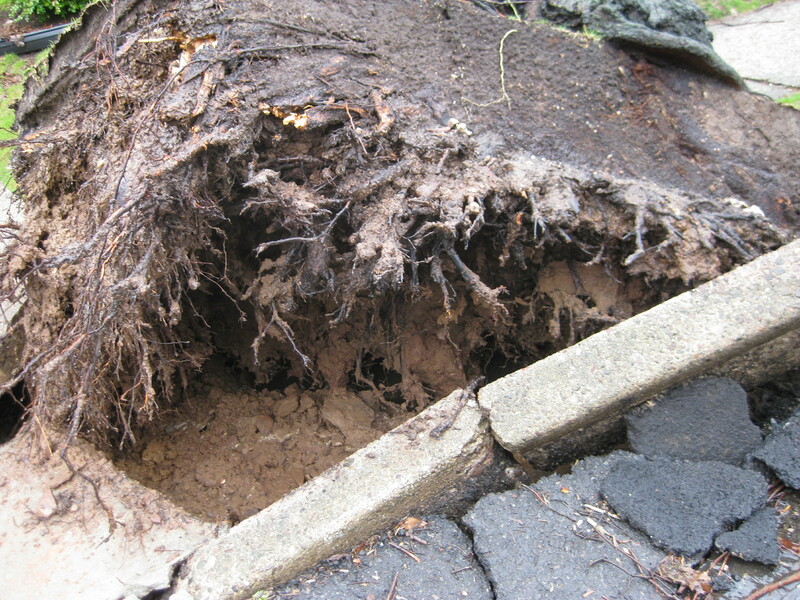 We plant hundreds of trees in town to keep up property values, make streets look nice, lower temperatures, preserve that smalltown American look, but we crowd the trees into little spaces so their roots can’t develop well. Another irony here? 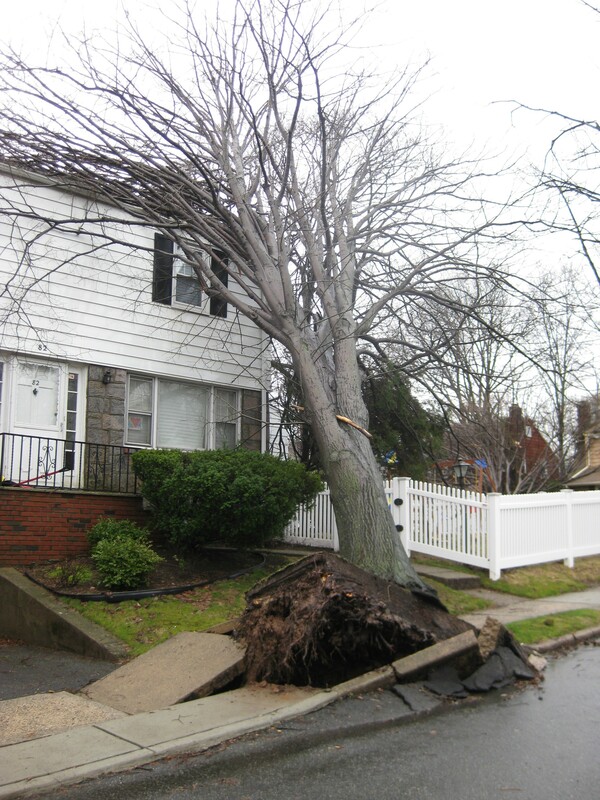 The unintended effect – death, disruption, property damage – from a beneficial action, planting trees. Shall we cut down all the trees? Then we would be safe! 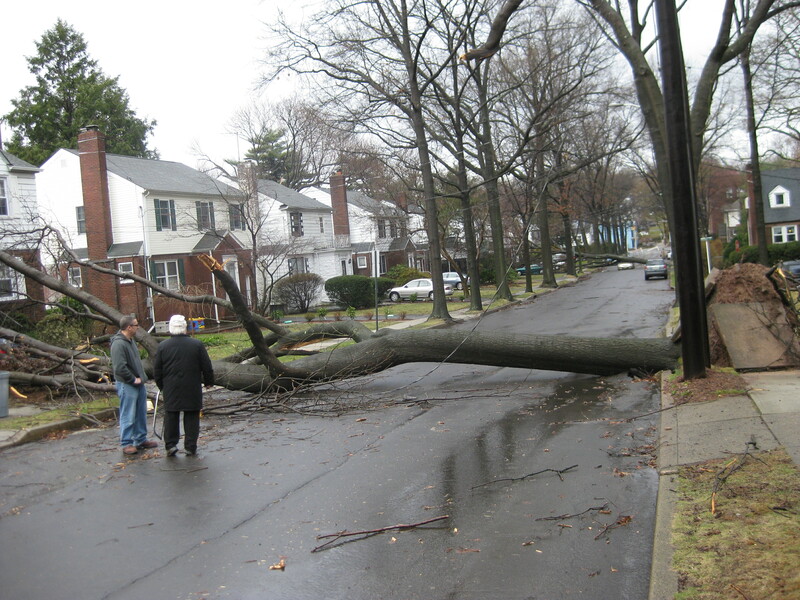 Or, as Jean Jacques observed, if we did not insist on living in such close proximity to one another, falling trees would hardly be such a problem.